Royal Philips Electronics (NYSE: PHG, AEX: PHI), today announced that it has joined forces with LAB ID and Psion Teklogix to provide Benetton with the world’s largest and most comprehensive item level tagging implementation of Radio Frequency Identification (RFID) technology in the fashion industry to date. Clothes produced under Benetton’s core brand Sisley have been fitted with RFID-enabled labels based on Philips’ I.CODE semiconductor technology. 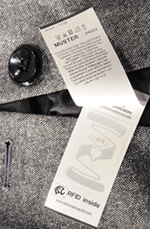 These labels are part of a complete system solution by LAB ID – the Italian system integrator – and are being used by Benetton to track its garments throughout the company’s entire supply chain. As part of this initiative, all garment box shipments from United Colours of Benetton are also to be labeled with I.CODE-based smart labels. These are tracked using I.CODE-compatible readers and wireless LAN netpads developed and manufactured by LAB ID and Psion Teklogix respectively. Philips’ I.CODE ICs, which are embedded in labels, are incorporated into garments during the manufacturing process. They are imperceptible to the wearer and remain in individual items of clothing throughout their lifetime. The labels store information relating to the style, size, color and intended destination of items, radically automating key aspects of Benetton’s supply chain from manufacturing and distribution through to inventory control across the company’s 5,000 stores worldwide. The box labels are used to track box shipments throughout Benetton’s logistics process enabling improved identification and item to box correlation, while optimizing the timing of shipments and inventory control and minimizing distribution errors. Smart labels overcome the limitations of traditional barcode technology. For the fashion industry this is particularly important in terms of authentication, accurate inventory control and checking multiple items in and out of the various stages of the supply chain. Philips’ I.CODE ICs enable a highly automated scanning process that does not require line of sight and can scan multiple items at once. This means that a box containing a variety of garments in different styles, colors and sizes, which traditionally would have been unpacked and checked by hand, can be scanned in one go and the information uploaded directly into the company’s main computer system. In store, Benetton will use RFID technology in smart shelves and in dressing rooms to highlight where individual garments are located. This technology will also be employed at the point of sale, automatically registering sales and returns and feeding information back into the company’s ordering system to ensure that stock levels are replenished in the most efficient way possible. I.CODE is part of Philips’ family of RFID ICs, specifically designed for use in high volume logistics applications including retail supply chain management, rental and asset management. Philips’ I.CODE ICs can store unique data enabling the authentication of goods and the prevention of counterfeiting. They can be integrated into labels and / or tags, that in turn can be fitted to almost any item to facilitate asset tracking, automatic data capture and theft protection providing a low-cost, reprogrammable solution for companies looking to implement a highly automated and efficient supply chain management system.